Can CalenGoo sync with Outlook or Exchange? 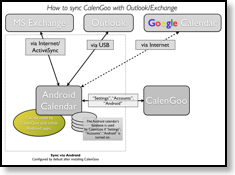 If your device can already sync the Android calendar with Outlook, CalenGoo can access and modify this calendar. Some vendors deliver PC software for this purpose with their phones (like Samsung KIES (Overview and download, Documentation) or HTC Sync (Overview and download)) to sync the Android calendar with Outlook via USB. 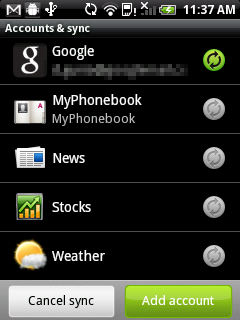 Or you can use an independent solution like MyPhoneExplorer. So if you can sync the Android calendar with Outlook somehow, you can use CalenGoo with that calendar, too. Or you can sync Outlook with Google Calendar by using e.g. a commercial solution like GSyncIt (with support) or a free solution like Outlook CalDav Synchronizer (but probably without support and more difficult to set up). Then CalenGoo can simply sync with Google Calendar and this way sync with your Outlook calendar, too. GSyncIt also supports syncing different Outlook categories into different Google calendars or to use different Google colors for different Outlook categories. To use different Google colors it might be necessary to rename the Outlook categories. If your device can already sync the Android calendar with Exchange, CalenGoo can access and modify this calendar. E.g. on Motorola devices there is the special “Corporate calendar” app and on HTC devices there is an “Exchange” calendar in the normal calendar list. It may be necessary to turn “Settings > Display and Use > Maintenance > Trigger upload immediately (Exchange)” on in CalenGoo to force an upload after you have made some changes with CalenGoo. And if you have problems that events are not deleted in Exchange, please turn “Settings > Display and Use > Maintenance > Force upload of many deletes (Exchange)” on. 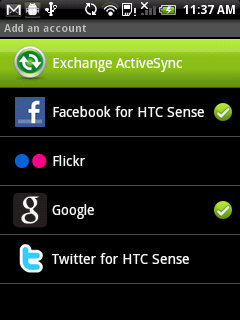 Another option is to install a 3rd party app that can sync the Android calendar with Exchange like "AquaMail" or "Nine". It can do the same as the built-in functions mentioned above, i.e. it can sync the Android calendar with Exchange so that CalenGoo can be used with your Exchange account. Afterward you Exchange calendars and events should appear in a calendar called “Exchange” and you should be able to see and edit them with CalenGoo. Outlook’s categories are used to assign colors to events. They are similar to Google’s calendars. 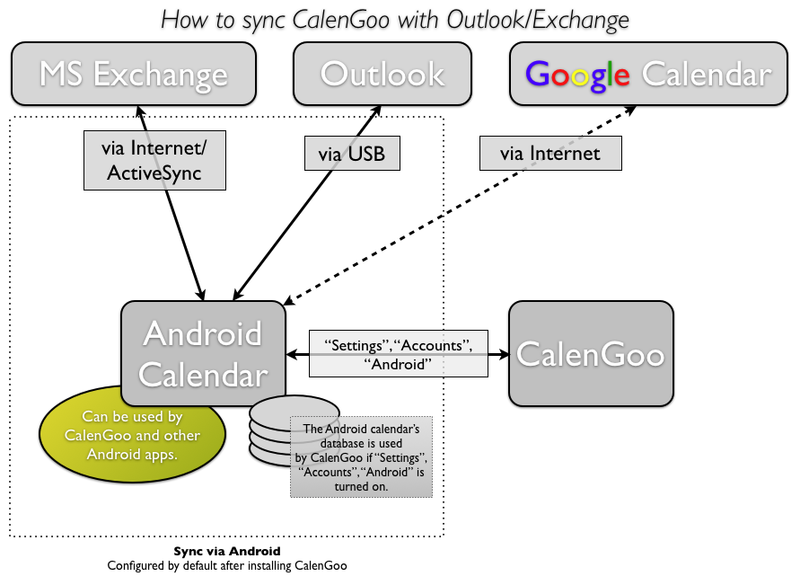 As described above, CalenGoo cannot sync directly with Exchange/Outlook yet, it can only be synced via the Android calendar. So to see these Outlook category colors in CalenGoo, you have to get them into the Android calendar. For this purpose your Exchange/Outlook sync app should sync the Outlook categories to different Android calendars. Then you can see your events in different colors in the Android stock calendar app and in CalenGoo. If your Exchange/Outlook sync app doesn’t do this, then you can contact the vendor of that software and ask him if this can be changed. A solution that works is to sync Outlook with Google Calendar via GSyncIt. GSyncIt can be configured to sync different Outlook categories to different Google calendars (and this way to different Android calendars). When syncing this way, you and see and use your Outlook categories in CalenGoo. CalenGoo can sync tasks with Microsoft Exchange servers. Just enter your Exchange account under "Settings > Tasks > Add account > Microsoft Exchange" in CalenGoo. On your device, tap Email, then tap Add account. Enter your Outlook.com/Office 365 email address and password, then tap Manual setup. Under What type of account is this? tap Exchange. If there is a Domain field, leave it blank. If there is a Username field, enter your email address. For Server name enter s.outlook.com for an Outlook.com account or outlook.office365.com for an Office 365 account. Make sure the Use secure connection (SSL) checkbox is checked, then tap Next. 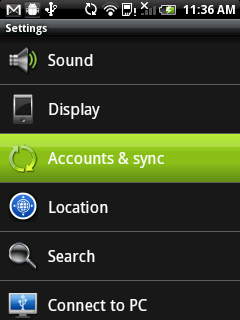 Choose your account options and tap Next. To finish setup, tap Done.